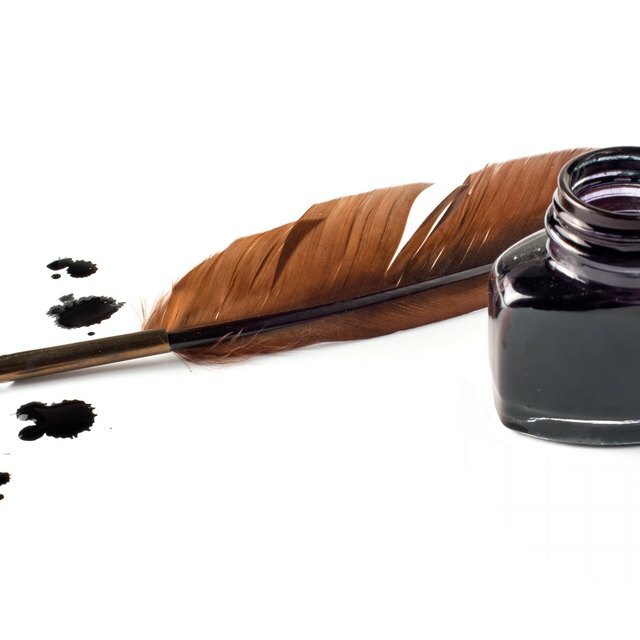 What Are the Different Types of Pen Ink? A good writing pen allows you to express your personal style on paper and is easy to write with. Pens come in many shapes and types, and each pen offers its own unique advantages and disadvantages to the writer. When choosing a pen, pick a pen that you find leaves good, sharp ink on the page, is easy to write with and is comfortable in your hand. Fountain pens date back to the 1880s and can be very expensive when compared to their disposable cousins. A fountain pen uses a metal nib to channel liquid ink from a cartridge or reservoir onto your paper. The nib of a fountain pen is versatile and allows you to shape the ink as it flows onto the paper, giving your writing its own, personal style. When the ink in a fountain pen runs dry, the pen can be refilled with fresh ink. Fountain pens are more likely to leak than other types of pens, but a well-maintained fountain pen can last several years. Ballpoint pens are inexpensive, disposable pens that are easy to find and have a very long ink life. Ballpoint pens have a tiny ball at the tip of the pen cylinder that uses capillary action to funnel the oil-based ink from the pen cartridge onto the paper; as a result, ballpoint pens do not need to be held vertically in order to write. Ballpoint ink can be sticky, and the tip of your ballpoint pen may occasionally gum up with paper fiber, but they are easy to clean and maintain. Ballpoint pens can be found everywhere and are inexpensive to replace if lost. Felt tip pens have a thin, felt nub at the tip of the pen that uses capillary action to funnel ink from the pen cartridge to the paper, much like a ballpoint pen. Unlike the ballpoint pen, the felt tip nub is more expressive than a ballpoint nub, which makes it easier for you to express personal style in your writing. Roller ball pens are similar to ballpoint pens but use a water-based ink in their cartridges instead of an oil-based ink. A roller ball pen produces a thicker, smoother line than a ballpoint pen, but the ink takes longer to dry and, like a fountain pen, is more prone to smudging. Roller ball pens write with the ease of a fountain pen but have the convenience of a ballpoint pen. Gel pens use a thick, gel-based ink in their cartridges that retains color pigments well and does not fade. Like roller ball and ballpoint pens, gel pens use a ballpoint nib to channel the ink onto the paper. Gel pens come in a wide variety of colors and give you a smooth, crisp line but have a very short lifespan when compared to ballpoint and roller ball pens. William Nagel is a graduate of the Georgia Institute of Technology, where he studied science, technology and culture. He has been writing since 2007 and specializes in computer hardware, operating systems and software documentation. His work has been published in the "North Avenue Review."